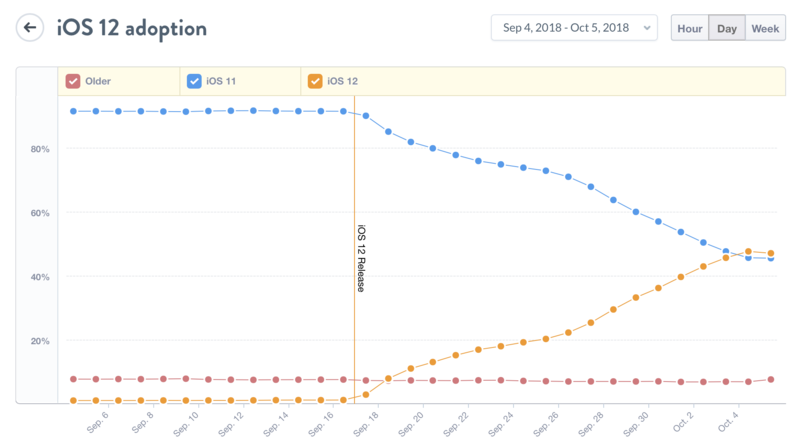 Analytics company Mixpanel is currently tracking the install base of iOS 12. And the latest version of iOS is quite popular, as it’s already installed on roughly 47.6 percent of all iOS devices; 45.6 percent of devices still run iOS 11, and 6.9 percent of iOS users run an older version. Adoption rate is an important metric for app developers. With major iOS releases, Apple also releases new frameworks. But developers still need to support old versions of iOS for a little bit before moving entirely to newer frameworks and dropping support for old iOS versions. But it’s interesting to see that you can already drop support for iOS 10 without losing too many customers. Chances are that users who don’t update their version of iOS don’t really care about having the latest version of your app anyway. With iOS 11, it took much longer to reach that level. Last year, Apple announced on November 6th that iOS 11 was more popular than iOS 10. Sure, Mixpanel and Apple don’t have the exact same numbers, but you can already see that the trend is different this year. iOS 12 focuses on performance. Apple has optimized this major release for older devices, such as the iPhone 6. All devices that run iOS 11 can update to iOS 12 as well. Basically, if you want a faster phone, you should update to iOS 12. This is a bit counterintuitive, as previous iOS releases had rendered older devices much slower. But based on the adoption rate, it sounds like iOS users got the message.